New MagnaShear™ hazardous duty brakes from Force Control Industries, which employ oil shear technology to provide longer service life with virtually no maintenance or adjustment, now meet Class I and Class II Div 2 specifications (Div 1 in process with approval forthcoming). With spring set torque ratings from 3 to 900 foot-pounds available, MagnaShear™ motor brakes can be sized to the correct torque independent of the motor frame size or horsepower. They also feature “quick mount” features for quick and easy mounting to drive motors in NEMA frame sizes 56 to 405. These proven motor brakes are totally enclosed from outside contaminants, with seal integrity for harsh and washdown environments. A modular design /assembly allows for ease of servicing and maintenance. MagnaShear™ motor brakes are ideal for applications where the motor is reversed each cycle such as cranes, winches, and hoists as well as ship and railcar loader/unloader conveyors, tippers, sweep samplers and more. Proven oil shear technology transmits torque between lubricated surfaces – thereby eliminating wear on friction surfaces, providing longer service life with no maintenance or adjustment. A patented fluid recirculation system dissipates heat – eliminating heat build-up which is the most common problem in dry braking systems. The oil shear technology also provides a smooth “cushioned” stop which reduces shock to the drive system, further extending service life of downstream components. The totally enclosed MagnaShear™ brakes are impervious to moisture, dirt and dust that is common in many industrial environments. Unlike dry brakes, oil shear technology includes a layer of automatic transmission fluid between the brake disc and the drive plate. As the fluid is compressed, the fluid molecules shear – thus imparting torque to the other side. This torque transmission causes the stationary surface to turn, bringing it up to the same relative speed as the moving surface. Since most of the work is done by the fluid particles in shear, wear is virtually eliminated. Elimination of wear also eliminates the need for adjustments which are common for dry braking systems. In addition to transmitting torque, a patented fluid recirculation system helps to dissipate heat which is the major problem with traditional dry brakes. Along with heat removal and torque transmission, the fluid serves to continually lubricate all components of the oil shear brake, elongating their service life. MagnaShear™ brakes with oil shear technology provide significantly longer service life, characterized by virtually maintenance-free operations. They are shipped ready to install, with no assembly or adjustments required. 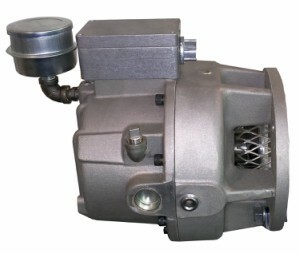 They are also available pre-mounted on a hazardous duty motor for severe applications. 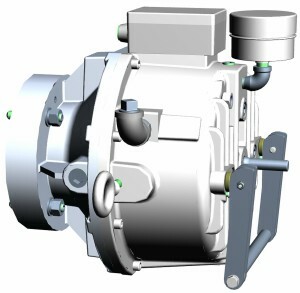 MagnaShear™ motor brakes can be furnished to fit a NEMA or IEC frame motor, as a complete motor and brake assembly, or to mount on a machine frame or other special mounting configuration. Headquartered in Fairfield, Ohio, Force Control Industries is the world leader in oil shear technology, offering a full line of clutches, brakes, and clutch brakes for OEMs in diverse applications. Their manufacturing campus includes three manufacturing facilities with over 100,000 square feet of manufacturing space along with engineering, design, customer support and administrative offices. All facilities are ISO9001/2000 certified for quality assurance. For additional information contact Force Control Industries, Inc., 3660 Dixie Highway, Fairfield, OH 45014, or visit www.forcecontrol.com, e-mail sales@forcecontrol.com, or call (513) 868-0900.